Chaddleworth War Memorial – Dedication Service, 25 Aug 1920. W J Bradley, Lce-Cpl, Royal Berks Regt. H Chisman, Cpl, Berks Yeomanry. W Goatley, Pte, Royal Berks Regt. H Lewington , Pte, Royal Berks Regt. A Pearce , Pte, Royal Berks Regt. D Pearce , Pte, Royal Berks Regt. J Pearce, Sergt, Hants Regt. E Pounds , Pte, Royal Berks Regt. J Pullinger , Lce-Cpl, Royal Berks Regt. S Sayers , Pte, Royal Berks Regt. A Smith , Pte, Royal Berks Regt. G Smith , Pte, Royal Berks Regt. W J Uzzel, Driver, Rl. Garrison Arty. A Tribute to Berkshire Men. Brigadier-General Wigan then unveiled the memorial, which he said was dedicated to God in gratitude and respect for those gallant men who went from that village and died that they might live. The fitness of the memorial seemed to him to be enhanced from the fact that it was designed as a work of love by a local resident of theirs, Major Lucas. During the great war through which they had passed, they had seen men rallying to the ranks from every part of the Empire, men differing in race and in creed. They had seen Mahommedans and Hindoos from India, coloured men from Jamaica; they had seen their own kith and kin from Canada, Australia and New Zealand, all rallying round the flag and for a righteous cause. They had terminated the war victoriously at the end of five most awful years. It was idle to say that this politician or that general won the war. The people who won the war were the fighting soldiers, and but for the pluck and endurance as was shown by the men whose names were on that memorial, however able their generals were, the war would have been in vain. 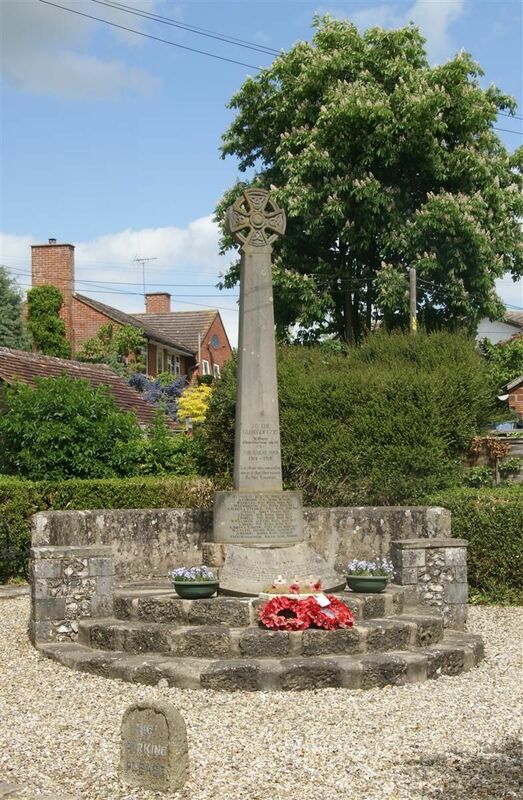 The men of Berkshire had fought the world over during the war. They knew what the Royal Berks Regiment did in France. They fought in Palestine and Egypt, they fought in Mesopotamia. He had read the list, and there were 14 heroes of that Regiment who went from that village and gave up their lives. He happened to be throughout the war in Gallipoli, Palestine and Syria with the Berkshire Yeomanry, and he knew that that Regiment, as he was told by General Peyton, was second to none in the cavalry of the Empire. He saw amongst the names on the memorial, two gallant men, two comrades in arms of his own. He felt he must refer to them specially, not that all those men did their duty equally to their country, but because he served with them. One was Corporal Chisman, son of respected and well-known people in the village. He went out in 1914, took part in that magnificent advance at Suvla Bay, and laid down his life for his country. No man could do more. Then he must say one word about a very great friend of his, the son of a respected father and mother. He succeeded his father to a position of great responsibility. He went out on mobilisation in 1914. He served with him (the speaker) until his life was taken, and during the whole time he had known his, as a civilian before the war, or as a soldier during the war, he could honestly say he had never met a finer type of English country gentleman, and he was one whose loss he knew was keenly felt in those parts. He had the respect of this who served under him, and of those under whom he served. He saw that from the parish whose total population he was told was under 250, over 68 men went out. He knew of no village with a finer record that that of Chaddleworth. He did hope that in years to come they and their children, and their children’s children would look with pride and gratitude at that beautiful memorial, and if there were difficulties at home or abroad, the sight of it would make them make their minds to play their part as good citizens of the British Empire, in the same way that those gallant men did whose names they saw on the Cross. He concluded with the words of the King’s message to the bereaved. Thos whom this Cross commemorates were numbered amongst those who, at the call of King and Country left all that was dear to them, endured hardness, faced danger, and finally passed out of the sight of men by the path of duty and self-sacrifice, giving up their own lives that others might live in freedom. Let those who come after see to it that their names be not forgotten. He had no more to say, but it had been a great honour and privilege to him to be allowed to unveil that Memorial. The service then concluded with the singing of the hymn, “For all the Saints,” and the Blessing, and then a bugler from the Royal Berkshire Depot at Reading sounded the haunting notes of the Last Post. The memorable ceremony concluded with the singing of the National Anthem. The Memorial was designed by Major Lucas, RFA, of Oakhouse, whilst the secretarial work was carried out by Mr Charles Masters.